All Posts Tagged With: "Dior Mascara"
The first mascara to plump lashes inside and out—wear it alone or pair it with your favorite Dior mascaras. 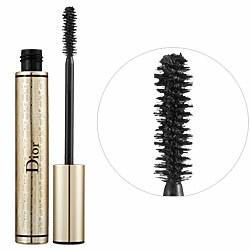 DiorShow Extase ($28) provides built-in treatment benefits and high-impact lashes in a single stroke! The spherical-shaped Black Pearl Pigments create a 3D volume effect and the exclusive Metamorphosis Powders expand in size by up to 50% after application. Also, SR38 Patented Ceramid brings additional care, reconstructing damaged lashes and promoting stronger and fuller lashes.